3rd Row Seat, Keyless Start, Dual Zone A/C. SE trim, Vice White exterior and Black interior. FUEL EFFICIENT 25 MPG Hwy/19 MPG City! CLICK NOW! KEY FEATURES INCLUDE Third Row Seat, iPod/MP3 Input, Keyless Start, Dual Zone A/C. Privacy Glass, Keyless Entry, Child Safety Locks, Steering Wheel Controls, Heated Mirrors. OPTION PACKAGES CONNECTIVITY GROUP Radio: 4.3S, Uconnect Voice Command w/Bluetooth, Leather Wrapped Shift Knob, Leather Wrapped Steering Wheel, BLACKTOP PACKAGE Black Headlamp Bezels, Wheels: 17 x 6.5 Aluminum w/Blacktop Package, Gloss Black Grille, ENGINE: 2.4L I4 DOHC 16V DUAL VVT (STD), TRANSMISSION: 4-SPEED AUTOMATIC VLP (STD), QUICK ORDER PACKAGE 22B Engine: 2.4L I4 DOHC 16V Dual VVT, Transmission: 4-Speed Automatic VLP, Rear View Auto Dim Mirror w/Display, ParkView Rear Back-Up Camera. Dodge SE with Vice White exterior and Black interior features a 4 Cylinder Engine with 173 HP at 6000 RPM*. WHY BUY FROM US If you are a new or veteran Chrysler, Dodge, Jeep or RAM enthusiast in the greater Rawlins, Evanston, Pinedale, Vernal area, you're in the right spot! Fremont Motor Rock Springs offers an envious selection of the season's hottest-selling Chrysler, Dodge, Jeep and RAM models as well as wide selection of reliable used cars. Horsepower calculations based on trim engine configuration. Fuel economy calculations based on original manufacturer data for trim engine configuration. Please confirm the accuracy of the included equipment by calling us prior to purchase. 3rd Row Seat, Keyless Start, Dual Zone A/C. SE trim, Granite Pearlcoat exterior and Black interior. EPA 25 MPG Hwy/19 MPG City! SEE MORE! KEY FEATURES INCLUDE Third Row Seat, Rear Air, Back-Up Camera, iPod/MP3 Input, CD Player, Keyless Start, Dual Zone A/C. MP3 Player, Keyless Entry, Privacy Glass, Child Safety Locks, Steering Wheel Controls. OPTION PACKAGES ENGINE: 2.4L I4 DOHC 16V DUAL VVT (STD), TRANSMISSION: 4-SPEED AUTOMATIC VLP (STD). Dodge SE with Granite Pearlcoat exterior and Black interior features a 4 Cylinder Engine with 173 HP at 6000 RPM*. This vehicle comes with Fremont Care. BUY FROM AN AWARD WINNING DEALER A Tradition of excellence continues here at Fremont Motors. Give us a call and see what we have to offer and we can help you find the vehicle that fits your needs! Prices do not include additional fees and costs of closing; including government fees and taxes; any finance charges; dealer documentation fee of $389; any emissions testing fees or other fees. All prices; specifications and availability subject to change without notice. Contact dealer for most current information. Horsepower calculations based on trim engine configuration. Fuel economy calculations based on original manufacturer data for trim engine configuration. Please confirm the accuracy of the included equipment by calling us prior to purchase. Third Row Seat, Keyless Start, Dual Zone A/C. Contusion Blue Pearlcoat exterior and Black interior, SE trim. EPA 25 MPG Hwy/19 MPG City! AND MORE! KEY FEATURES INCLUDE Third Row Seat, Rear Air, Back-Up Camera, iPod/MP3 Input, CD Player, Keyless Start, Dual Zone A/C. MP3 Player, Keyless Entry, Privacy Glass, Steering Wheel Controls, Child Safety Locks. OPTION PACKAGES ENGINE: 2.4L I4 DOHC 16V DUAL VVT (STD), TRANSMISSION: 4-SPEED AUTOMATIC VLP (STD). Dodge SE with Contusion Blue Pearlcoat exterior and Black interior features a 4 Cylinder Engine with 173 HP at 6000 RPM*. This vehicle comes with Fremont Care. OUR OFFERINGS A Tradition of excellence continues here at Fremont Motors. Give us a call and see what we have to offer and we can help you find the vehicle that fits your needs! Prices do not include additional fees and costs of closing; including government fees and taxes; any finance charges; dealer documentation fee of $389; any emissions testing fees or other fees. All prices; specifications and availability subject to change without notice. Contact dealer for most current information. Horsepower calculations based on trim engine configuration. Fuel economy calculations based on original manufacturer data for trim engine configuration. Please confirm the accuracy of the included equipment by calling us prior to purchase. 3rd Row Seat, Keyless Start, Dual Zone A/C, CD Player. Vice White exterior, SXT trim. FUEL EFFICIENT 25 MPG Hwy/17 MPG City! AND MORE! KEY FEATURES INCLUDE Third Row Seat, Rear Air, iPod/MP3 Input, CD Player, Keyless Start, Dual Zone A/C. MP3 Player, Privacy Glass, Keyless Entry, Child Safety Locks, Steering Wheel Controls. OPTION PACKAGES ENGINE: 3.6L V6 24V VVT Engine Oil Cooler, Flex Fuel Vehicle, Dual Bright Exhaust Tips (STD), BLACKTOP PACKAGE Black Headlamp Bezels, Gloss Black Rear Fascia Applique, Wheels: 17 x 6.5 Aluminum w/Blacktop Package, Gloss Black Grille, Gloss Black Exterior Mirrors, TRANSMISSION: 6-SPEED AUTOMATIC 62TE (STD), QUICK ORDER PACKAGE 28D V6 VALUE PACKAGE Engine: 3.6L V6 24V VVT, Transmission: 6-Speed Automatic 62TE, 17 Wheel Covers, Rear View Auto Dim Mirror w/Display, Value Package, ParkView Rear Back-Up Camera. OUR OFFERINGS If you are a new or veteran Chrysler, Dodge, Jeep or RAM enthusiast in the greater Rawlins, Evanston, Pinedale, Vernal area, you're in the right spot! Fremont Motor Rock Springs offers an envious selection of the season's hottest-selling Chrysler, Dodge, Jeep and RAM models as well as wide selection of reliable used cars. Fuel economy calculations based on original manufacturer data for trim engine configuration. Please confirm the accuracy of the included equipment by calling us prior to purchase. Third Row Seat, Keyless Start. Granite Pearlcoat exterior and Black interior, SXT trim. FUEL EFFICIENT 25 MPG Hwy/17 MPG City! READ MORE! KEY FEATURES INCLUDE Third Row Seat, Rear Air, iPod/MP3 Input, CD Player, Keyless Start, Dual Zone A/C. MP3 Player, Keyless Entry, Privacy Glass, Child Safety Locks, Steering Wheel Controls. OPTION PACKAGES ENGINE: 3.6L V6 24V VVT Engine Oil Cooler, Flex Fuel Vehicle, Dual Bright Exhaust Tips (STD), BLACKTOP PACKAGE Black Headlamp Bezels, Gloss Black Rear Fascia Applique, Wheels: 17 x 6.5 Aluminum w/Blacktop Package, Gloss Black Grille, Gloss Black Exterior Mirrors, TRANSMISSION: 6-SPEED AUTOMATIC 62TE (STD), QUICK ORDER PACKAGE 28D V6 VALUE PACKAGE Engine: 3.6L V6 24V VVT, Transmission: 6-Speed Automatic 62TE, 17 Wheel Covers, Rear View Auto Dim Mirror w/Display, Value Package, ParkView Rear Back-Up Camera. Dodge SXT with Granite Pearlcoat exterior and Black interior features a V6 Cylinder Engine with 283 HP at 6350 RPM*. VISIT US TODAY If you are a new or veteran Chrysler, Dodge, Jeep or RAM enthusiast in the greater Rawlins, Evanston, Pinedale, Vernal area, you're in the right spot! Fremont Motor Rock Springs offers an envious selection of the season's hottest-selling Chrysler, Dodge, Jeep and RAM models as well as wide selection of reliable used cars. Horsepower calculations based on trim engine configuration. Fuel economy calculations based on original manufacturer data for trim engine configuration. Please confirm the accuracy of the included equipment by calling us prior to purchase. Third Row Seat, CD Player, Keyless Start, Dual Zone A/C, iPod/MP3 Input. SXT trim, Pitch Black Clearcoat exterior and Black interior READ MORE! KEY FEATURES INCLUDE Third Row Seat, Rear Air, iPod/MP3 Input, CD Player, Keyless Start, Dual Zone A/C. MP3 Player, Keyless Entry, Privacy Glass, Child Safety Locks, Steering Wheel Controls. OPTION PACKAGES ENGINE: 3.6L V6 24V VVT Engine Oil Cooler, Flex Fuel Vehicle, Dual Bright Exhaust Tips (STD), BLACKTOP PACKAGE Black Headlamp Bezels, Gloss Black Rear Fascia Applique, Wheels: 17 x 6.5 Aluminum w/Blacktop Package, Gloss Black Grille, Gloss Black Exterior Mirrors, TRANSMISSION: 6-SPEED AUTOMATIC 62TE (STD), QUICK ORDER PACKAGE 28D V6 VALUE PACKAGE Engine: 3.6L V6 24V VVT, Transmission: 6-Speed Automatic 62TE, 17 Wheel Covers, Rear View Auto Dim Mirror w/Display, Value Package, ParkView Rear Back-Up Camera. Dodge SXT with Pitch Black Clearcoat exterior and Black interior features a V6 Cylinder Engine with 283 HP at 6350 RPM*. WHO WE ARE If you are a new or veteran Chrysler, Dodge, Jeep or RAM enthusiast in the greater Rawlins, Evanston, Pinedale, Vernal area, you're in the right spot! Fremont Motor Rock Springs offers an envious selection of the season's hottest-selling Chrysler, Dodge, Jeep and RAM models as well as wide selection of reliable used cars. Horsepower calculations based on trim engine configuration. Fuel economy calculations based on original manufacturer data for trim engine configuration. Please confirm the accuracy of the included equipment by calling us prior to purchase. 3rd Row Seat, CD Player, Keyless Start. Redline 2 Coat Pearl exterior and Black interior. FUEL EFFICIENT 25 MPG Hwy/17 MPG City! SEE MORE! KEY FEATURES INCLUDE Third Row Seat, Rear Air, iPod/MP3 Input, CD Player, Keyless Start, Dual Zone A/C. MP3 Player, Keyless Entry, Privacy Glass, Child Safety Locks, Steering Wheel Controls. OPTION PACKAGES ENGINE: 3.6L V6 24V VVT Engine Oil Cooler, Flex Fuel Vehicle, Dual Bright Exhaust Tips (STD), BLACKTOP PACKAGE Black Headlamp Bezels, Gloss Black Rear Fascia Applique, Wheels: 17 x 6.5 Aluminum w/Blacktop Package, Gloss Black Grille, Gloss Black Exterior Mirrors, TRANSMISSION: 6-SPEED AUTOMATIC 62TE (STD), QUICK ORDER PACKAGE 28D V6 VALUE PACKAGE Engine: 3.6L V6 24V VVT, Transmission: 6-Speed Automatic 62TE, 17 Wheel Covers, Rear View Auto Dim Mirror w/Display, Value Package, ParkView Rear Back-Up Camera. Dodge SXT with Redline 2 Coat Pearl exterior and Black interior features a V6 Cylinder Engine with 283 HP at 6350 RPM*. MORE ABOUT US If you are a new or veteran Chrysler, Dodge, Jeep or RAM enthusiast in the greater Rawlins, Evanston, Pinedale, Vernal area, you're in the right spot! Fremont Motor Rock Springs offers an envious selection of the season's hottest-selling Chrysler, Dodge, Jeep and RAM models as well as wide selection of reliable used cars. Horsepower calculations based on trim engine configuration. Fuel economy calculations based on original manufacturer data for trim engine configuration. Please confirm the accuracy of the included equipment by calling us prior to purchase. Third Row Seat, Keyless Start, Dual Zone A/C. EPA 25 MPG Hwy/17 MPG City! Pitch Black Clearcoat exterior and Black interior, SXT trim READ MORE! KEY FEATURES INCLUDE Third Row Seat, Rear Air, iPod/MP3 Input, CD Player, Keyless Start, Dual Zone A/C MP3 Player, Keyless Entry, Privacy Glass, Child Safety Locks, Steering Wheel Controls. OPTION PACKAGES ENGINE: 3.6L V6 24V VVT Engine Oil Cooler, Flex Fuel Vehicle, Dual Bright Exhaust Tips (STD), BLACKTOP PACKAGE Black Headlamp Bezels, Gloss Black Rear Fascia Applique, Wheels: 17 x 6.5 Aluminum w/Blacktop Package, Gloss Black Grille, Gloss Black Exterior Mirrors, TRANSMISSION: 6-SPEED AUTOMATIC 62TE (STD), QUICK ORDER PACKAGE 28D V6 VALUE PACKAGE Engine: 3.6L V6 24V VVT, Transmission: 6-Speed Automatic 62TE, 17 Wheel Covers, Rear View Auto Dim Mirror w/Display, Value Package, ParkView Rear Back-Up Camera. Dodge SXT with Pitch Black Clearcoat exterior and Black interior features a V6 Cylinder Engine with 283 HP at 6350 RPM*. VISIT US TODAY If you are a new or veteran Chrysler, Dodge, Jeep or RAM enthusiast in the greater Rawlins, Evanston, Pinedale, Vernal area, you're in the right spot! Fremont Motor Rock Springs offers an envious selection of the season's hottest-selling Chrysler, Dodge, Jeep and RAM models as well as wide selection of reliable used cars. Horsepower calculations based on trim engine configuration. Fuel economy calculations based on original manufacturer data for trim engine configuration. Please confirm the accuracy of the included equipment by calling us prior to purchase. Third Row Seat, Keyless Start. Redline 2 Coat Pearl exterior and Black interior, SXT trim. FUEL EFFICIENT 25 MPG Hwy/17 MPG City! READ MORE! KEY FEATURES INCLUDE Third Row Seat, Rear Air, iPod/MP3 Input, CD Player, Keyless Start, Dual Zone A/C. MP3 Player, Keyless Entry, Privacy Glass, Child Safety Locks, Steering Wheel Controls. OPTION PACKAGES ENGINE: 3.6L V6 24V VVT Engine Oil Cooler, Flex Fuel Vehicle, Dual Bright Exhaust Tips (STD), BLACKTOP PACKAGE Black Headlamp Bezels, Gloss Black Rear Fascia Applique, Wheels: 17 x 6.5 Aluminum w/Blacktop Package, Gloss Black Grille, Gloss Black Exterior Mirrors, TRANSMISSION: 6-SPEED AUTOMATIC 62TE (STD), QUICK ORDER PACKAGE 28D V6 VALUE PACKAGE Engine: 3.6L V6 24V VVT, Transmission: 6-Speed Automatic 62TE, 17 Wheel Covers, Rear View Auto Dim Mirror w/Display, Value Package, ParkView Rear Back-Up Camera. Dodge SXT with Redline 2 Coat Pearl exterior and Black interior features a V6 Cylinder Engine with 283 HP at 6350 RPM*. VISIT US TODAY If you are a new or veteran Chrysler, Dodge, Jeep or RAM enthusiast in the greater Rawlins, Evanston, Pinedale, Vernal area, you're in the right spot! Fremont Motor Rock Springs offers an envious selection of the season's hottest-selling Chrysler, Dodge, Jeep and RAM models as well as wide selection of reliable used cars. Horsepower calculations based on trim engine configuration. Fuel economy calculations based on original manufacturer data for trim engine configuration. Please confirm the accuracy of the included equipment by calling us prior to purchase. 3rd Row Seat, Dual Zone A/C, Keyless Start. SE trim, Granite Pearlcoat exterior and Black interior. EPA 25 MPG Hwy/19 MPG City! READ MORE! KEY FEATURES INCLUDE Third Row Seat, iPod/MP3 Input, Keyless Start, Dual Zone A/C Privacy Glass, Keyless Entry, Child Safety Locks, Steering Wheel Controls, Electronic Stability Control. OPTION PACKAGES POPULAR EQUIPMENT GROUP Air Conditioning w/3 Zone Temp Control, Interior Observation Mirror, Leather Wrapped Shift Knob, Leather Wrapped Steering Wheel, CONNECTIVITY GROUP Radio: 4.3S, Uconnect Voice Command w/Bluetooth, Leather Wrapped Shift Knob, Leather Wrapped Steering Wheel, BLACKTOP PACKAGE Black Headlamp Bezels, Wheels: 17 x 6.5 Aluminum w/Blacktop Package, Gloss Black Grille, ENGINE: 2.4L I4 DOHC 16V DUAL VVT (STD), TRANSMISSION: 4-SPEED AUTOMATIC VLP (STD), QUICK ORDER PACKAGE 22B Engine: 2.4L I4 DOHC 16V Dual VVT, Transmission: 4-Speed Automatic VLP, Rear View Auto Dim Mirror w/Display, ParkView Rear Back-Up Camera. Dodge SE with Granite Pearlcoat exterior and Black interior features a 4 Cylinder Engine with 173 HP at 6000 RPM*. WHY BUY FROM US If you are a new or veteran Chrysler, Dodge, Jeep or RAM enthusiast in the greater Rawlins, Evanston, Pinedale, Vernal area, you're in the right spot! Fremont Motor Rock Springs offers an envious selection of the season's hottest-selling Chrysler, Dodge, Jeep and RAM models as well as wide selection of reliable used cars. Horsepower calculations based on trim engine configuration. Fuel economy calculations based on original manufacturer data for trim engine configuration. Please confirm the accuracy of the included equipment by calling us prior to purchase. 3rd Row Seat, Keyless Start, Dual Zone A/C. EPA 25 MPG Hwy/19 MPG City! Billet Clearcoat exterior and Black interior, SE trim CLICK NOW! KEY FEATURES INCLUDE Third Row Seat, Rear Air, Back-Up Camera, iPod/MP3 Input, CD Player, Keyless Start, Dual Zone A/C. MP3 Player, Keyless Entry, Privacy Glass, Child Safety Locks, Steering Wheel Controls. OPTION PACKAGES ENGINE: 2.4L I4 DOHC 16V DUAL VVT (STD), TRANSMISSION: 4-SPEED AUTOMATIC VLP (STD). Dodge SE with Billet Clearcoat exterior and Black interior features a 4 Cylinder Engine with 173 HP at 6000 RPM*. This vehicle comes with Fremont Care. WHO WE ARE A Tradition of excellence continues here at Fremont Motors. Give us a call and see what we have to offer and we can help you find the vehicle that fits your needs! Prices do not include additional fees and costs of closing; including government fees and taxes; any finance charges; dealer documentation fee of $389; any emissions testing fees or other fees. All prices; specifications and availability subject to change without notice. Contact dealer for most current information. Horsepower calculations based on trim engine configuration. Fuel economy calculations based on original manufacturer data for trim engine configuration. Please confirm the accuracy of the included equipment by calling us prior to purchase. Third Row Seat. SE trim, Black Onyx Crystal Pearlcoat exterior and Black/Light Graystone interior. EPA 25 MPG Hwy/17 MPG City! CLICK ME! KEY FEATURES INCLUDE Third Row Seat, Rear Air, Back-Up Camera, iPod/MP3 Input, CD Player, Dual Zone A/C, Fourth Passenger Door. Rear Spoiler, Third Passenger Door, Privacy Glass, Keyless Entry, Child Safety Locks. OPTION PACKAGES UCONNECT HANDS-FREE GROUP Uconnect Voice Command w/Bluetooth, Bluetooth Streaming Audio, Remote USB Port, ENGINE: 3.6L V6 24V VVT, TRANSMISSION: 6-SPEED AUTOMATIC 62TE (STD). Dodge SE with Black Onyx Crystal Pearlcoat exterior and Black/Light Graystone interior features a V6 Cylinder Engine with 283 HP at 6400 RPM*. MORE ABOUT US If you are a new or veteran Chrysler, Dodge, Jeep or RAM enthusiast in the greater Rawlins, Evanston, Pinedale, Vernal area, you're in the right spot! Fremont Motor Rock Springs offers an envious selection of the season's hottest-selling Chrysler, Dodge, Jeep and RAM models as well as wide selection of reliable used cars. Horsepower calculations based on trim engine configuration. Fuel economy calculations based on original manufacturer data for trim engine configuration. Please confirm the accuracy of the included equipment by calling us prior to purchase. 3rd Row Seat, Dual Zone A/C. EPA 25 MPG Hwy/17 MPG City! SE trim, Billet Clearcoat exterior and Black/Light Graystone interior SEE MORE! KEY FEATURES INCLUDE Third Row Seat, Rear Air, Back-Up Camera, iPod/MP3 Input, CD Player, Dual Zone A/C, Fourth Passenger Door Rear Spoiler, Keyless Entry, Privacy Glass, Steering Wheel Controls. OPTION PACKAGES UCONNECT HANDS-FREE GROUP Uconnect Voice Command w/Bluetooth, Bluetooth Streaming Audio, Remote USB Port, ENGINE: 3.6L V6 24V VVT, TRANSMISSION: 6-SPEED AUTOMATIC 62TE (STD). Dodge SE with Billet Clearcoat exterior and Black/Light Graystone interior features a V6 Cylinder Engine with 283 HP at 6400 RPM*. This vehicle comes with Fremont Care. MORE ABOUT US A Tradition of excellence continues here at Fremont Motors. Give us a call and see what we have to offer and we can help you find the vehicle that fits your needs! Prices do not include additional fees and costs of closing; including government fees and taxes; any finance charges; dealer documentation fee of $389; any emissions testing fees or other fees. All prices; specifications and availability subject to change without notice. Contact dealer for most current information. Horsepower calculations based on trim engine configuration. Fuel economy calculations based on original manufacturer data for trim engine configuration. Please confirm the accuracy of the included equipment by calling us prior to purchase. 3rd Row Seat, Dual Zone A/C. EPA 25 MPG Hwy/17 MPG City! SE trim, Granite Pearlcoat exterior and Black/Light Graystone interior READ MORE! KEY FEATURES INCLUDE Third Row Seat, Rear Air, Back-Up Camera, iPod/MP3 Input, CD Player, Dual Zone A/C, Fourth Passenger Door. Rear Spoiler, Third Passenger Door, Keyless Entry, Privacy Glass, Steering Wheel Controls. OPTION PACKAGES UCONNECT HANDS-FREE GROUP Uconnect Voice Command w/Bluetooth, Bluetooth Streaming Audio, Remote USB Port, ENGINE: 3.6L V6 24V VVT, TRANSMISSION: 6-SPEED AUTOMATIC 62TE (STD). Dodge SE with Granite Pearlcoat exterior and Black/Light Graystone interior features a V6 Cylinder Engine with 283 HP at 6400 RPM*. OUR OFFERINGS If you are a new or veteran Chrysler, Dodge, Jeep or RAM enthusiast in the greater Rawlins, Evanston, Pinedale, Vernal area, you're in the right spot! Fremont Motor Rock Springs offers an envious selection of the season's hottest-selling Chrysler, Dodge, Jeep and RAM models as well as wide selection of reliable used cars. Horsepower calculations based on trim engine configuration. Fuel economy calculations based on original manufacturer data for trim engine configuration. Please confirm the accuracy of the included equipment by calling us prior to purchase. Third Row Seat, CD Player. Granite Pearlcoat exterior and Black interior, SE Plus trim. FUEL EFFICIENT 25 MPG Hwy/17 MPG City! CLICK ME! KEY FEATURES INCLUDE Third Row Seat, Rear Air, Back-Up Camera, iPod/MP3 Input, CD Player, Aluminum Wheels, Dual Zone A/C, Fourth Passenger Door Rear Spoiler, Keyless Entry, Privacy Glass, Steering Wheel Controls. OPTION PACKAGES QUICK ORDER PACKAGE 29H SE PLUS Engine: 3.6L V6 24V VVT (FFV), Transmission: 6-Speed Automatic 62TE, Floor Console w/Cupholder, Instrument Panel w/Piano Black Applique, Blacktop Package, Gloss Black Grille, Silver Accent Stitching, Black Headlamp Bezels, Front Fog Lamps, Rear Fascia Scuff Pad, Highline Door Trim Panel, Automatic Headlamps, Premium Interior Accents, Remote Start System, Security Alarm, Security Group, Leather Wrapped Shift Knob, Uconnect Voice Command w/Bluetooth, Bluetooth Streaming Audio, Remote USB Port, Leather Wrapped Steering Wheel, Sirius Satellite Radio, 1-Yr SiriusXM Radio Service, For More Info, Call 888-539-7474, 2ND ROW STOW'N GO BUCKET SEATS 3rd Row Stow 'N Go w/Tailgate Seats, ENGINE: 3.6L V6 24V VVT (FFV) (STD), TRANSMISSION: 6-SPEED AUTOMATIC 62TE (STD). Dodge SE Plus with Granite Pearlcoat exterior and Black interior features a V6 Cylinder Engine with 283 HP at 6400 RPM*. BUY FROM AN AWARD WINNING DEALER If you are a new or veteran Chrysler, Dodge, Jeep or RAM enthusiast in the greater Rawlins, Evanston, Pinedale, Vernal area, you're in the right spot! Fremont Motor Rock Springs offers an envious selection of the season's hottest-selling Chrysler, Dodge, Jeep and RAM models as well as wide selection of reliable used cars. Horsepower calculations based on trim engine configuration. Fuel economy calculations based on original manufacturer data for trim engine configuration. Please confirm the accuracy of the included equipment by calling us prior to purchase. 3rd Row Seat. White Knuckle Clearcoat exterior and Black/Light Graystone interior, SE trim. FUEL EFFICIENT 25 MPG Hwy/17 MPG City! CLICK NOW! KEY FEATURES INCLUDE Third Row Seat, Rear Air, Back-Up Camera, iPod/MP3 Input, CD Player, Dual Zone A/C, Fourth Passenger Door. Rear Spoiler, Third Passenger Door, Keyless Entry, Privacy Glass, Steering Wheel Controls. OPTION PACKAGES UCONNECT HANDS-FREE GROUP Uconnect Voice Command w/Bluetooth, Bluetooth Streaming Audio, Remote USB Port, BLACK SIDE ROOF RAILS Integrated Roof Rail Crossbars, TRANSMISSION: 6-SPEED AUTOMATIC 62TE (STD), ENGINE: 3.6L V6 24V VVT. Dodge SE with White Knuckle Clearcoat exterior and Black/Light Graystone interior features a V6 Cylinder Engine with 283 HP at 6400 RPM*. 1 yr Oil changes and One tire rotation. WHY BUY FROM US Welcome to Fremont Motor Company - Lander! Located in Lander, WY, Fremont Motor Company - Lander is proud to be one of the premier dealerships in the area. From the moment you walk into our showroom, you'll know our commitment to Customer Service is second to none. We strive to make your experience with Fremont Motor Company - Lander a good one - for the life of your vehicle. Horsepower calculations based on trim engine configuration. Fuel economy calculations based on original manufacturer data for trim engine configuration. Please confirm the accuracy of the included equipment by calling us prior to purchase. Third Row Seat, CD Player. EPA 25 MPG Hwy/17 MPG City! SE trim, Octane Red Pearlcoat exterior and Black/Light Graystone interior CLICK NOW! KEY FEATURES INCLUDE Third Row Seat, Rear Air, Back-Up Camera, iPod/MP3 Input, CD Player, Dual Zone A/C, Fourth Passenger Door Rear Spoiler, Privacy Glass, Keyless Entry, Steering Wheel Controls. OPTION PACKAGES 2ND ROW STOW'N GO BUCKET SEATS 3rd Row Stow 'N Go w/Tailgate Seats, UCONNECT HANDS-FREE GROUP Uconnect Voice Command w/Bluetooth, Bluetooth Streaming Audio, Remote USB Port, ENGINE: 3.6L V6 24V VVT, TRANSMISSION: 6-SPEED AUTOMATIC 62TE (STD). Dodge SE with Octane Red Pearlcoat exterior and Black/Light Graystone interior features a V6 Cylinder Engine with 283 HP at 6400 RPM*. WHO WE ARE If you are a new or veteran Chrysler, Dodge, Jeep or RAM enthusiast in the greater Rawlins, Evanston, Pinedale, Vernal area, you're in the right spot! Fremont Motor Rock Springs offers an envious selection of the season's hottest-selling Chrysler, Dodge, Jeep and RAM models as well as wide selection of reliable used cars. Horsepower calculations based on trim engine configuration. Fuel economy calculations based on original manufacturer data for trim engine configuration. Please confirm the accuracy of the included equipment by calling us prior to purchase. 3rd Row Seat, iPod/MP3 Input. FUEL EFFICIENT 24 MPG Hwy/16 MPG City! Blood Orange Clearcoat exterior and Black interior, SXT trim CLICK NOW! KEY FEATURES INCLUDE Third Row Seat, All Wheel Drive, Rear Air, iPod/MP3 Input, Keyless Start, Dual Zone A/C Keyless Entry, Privacy Glass, Child Safety Locks, Steering Wheel Controls, Heated Mirrors. OPTION PACKAGES PREMIUM GROUP Radio: 4.3S, Sirius Satellite Radio, 1-Year SiriusXM Radio Service, For More Info, Call 888-539-7474, Interior Observation Mirror, Power 4-Way Driver Lumber Adjust, Leather Wrapped Shift Knob, Leather Wrapped Steering Wheel, Power 6-Way Driver Seat, Security Alarm, TRANSMISSION: 6-SPEED AUTOMATIC 62TE (STD), ENGINE: 3.6L V6 24V VVT (STD), QUICK ORDER PACKAGE 28A Engine: 3.6L V6 24V VVT, Transmission: 6-Speed Automatic 62TE, Rear View Auto Dim Mirror w/Display, ParkView Rear Back-Up Camera, BLACKTOP PACKAGE Black Headlamp Bezels, Gloss Black Rear Fascia Applique, Gloss Black Grille, Wheels: 19 x 7 Gloss Black Aluminum, Tires: P225/55R19 BSW AS Touring, Gloss Black Exterior Mirrors, CONNECTIVITY GROUP Radio: 4.3S, Sirius Satellite Radio, 1-Year SiriusXM Radio Service, For More Info, Call 888-539-7474, Uconnect Voice Command w/Bluetooth, Leather Wrapped Steering Wheel. Dodge SXT with Blood Orange Clearcoat exterior and Black interior features a V6 Cylinder Engine with 283 HP at 6350 RPM*. WHO WE ARE If you are a new or veteran Chrysler, Dodge, Jeep or RAM enthusiast in the greater Rawlins, Evanston, Pinedale, Vernal area, you're in the right spot! Fremont Motor Rock Springs offers an envious selection of the season's hottest-selling Chrysler, Dodge, Jeep and RAM models as well as wide selection of reliable used cars. Horsepower calculations based on trim engine configuration. Fuel economy calculations based on original manufacturer data for trim engine configuration. Please confirm the accuracy of the included equipment by calling us prior to purchase. 3rd Row Seat, CD Player. FUEL EFFICIENT 25 MPG Hwy/17 MPG City! Black Onyx Crystal Pearlcoat exterior and Black interior, SE Plus trim SEE MORE! KEY FEATURES INCLUDE Third Row Seat, Rear Air, Back-Up Camera, iPod/MP3 Input, CD Player, Aluminum Wheels, Dual Zone A/C, Fourth Passenger Door. Rear Spoiler, Third Passenger Door, Keyless Entry, Privacy Glass, Child Safety Locks. OPTION PACKAGES QUICK ORDER PACKAGE 29H SE PLUS Engine: 3.6L V6 24V VVT (FFV), Transmission: 6-Speed Automatic 62TE, Floor Console w/Cupholder, Instrument Panel w/Piano Black Applique, Blacktop Package, Gloss Black Grille, Silver Accent Stitching, Black Headlamp Bezels, Front Fog Lamps, Rear Fascia Scuff Pad, Highline Door Trim Panel, Automatic Headlamps, Premium Interior Accents, Remote Start System, Security Alarm, Security Group, Leather Wrapped Shift Knob, Uconnect Voice Command w/Bluetooth, Bluetooth Streaming Audio, Remote USB Port, Leather Wrapped Steering Wheel, Sirius Satellite Radio, 1-Yr SiriusXM Radio Service, For More Info, Call 888-539-7474, POWER 8-WAY DRIVER SEAT Power 2-Way Driver Lumbar Adjust, BLACK SIDE ROOF RAILS Integrated Roof Rail Crossbars, ENGINE: 3.6L V6 24V VVT (FFV) (STD), TRANSMISSION: 6-SPEED AUTOMATIC 62TE (STD). Dodge SE Plus with Black Onyx Crystal Pearlcoat exterior and Black interior features a V6 Cylinder Engine with 283 HP at 6400 RPM*. WHO WE ARE If you are a new or veteran Chrysler, Dodge, Jeep or RAM enthusiast in the greater Rawlins, Evanston, Pinedale, Vernal area, you're in the right spot! Fremont Motor Rock Springs offers an envious selection of the season's hottest-selling Chrysler, Dodge, Jeep and RAM models as well as wide selection of reliable used cars. Horsepower calculations based on trim engine configuration. Fuel economy calculations based on original manufacturer data for trim engine configuration. Please confirm the accuracy of the included equipment by calling us prior to purchase. Third Row Seat, iPod/MP3 Input, Dual Zone A/C. SXT trim, Vice White exterior and Black interior. FUEL EFFICIENT 24 MPG Hwy/16 MPG City! READ MORE! KEY FEATURES INCLUDE Third Row Seat, All Wheel Drive, Rear Air, iPod/MP3 Input, Keyless Start, Dual Zone A/C. Keyless Entry, Privacy Glass, Child Safety Locks, Steering Wheel Controls, Heated Mirrors. OPTION PACKAGES PREMIUM GROUP Radio: 4.3S, Interior Observation Mirror, Power 4-Way Driver Lumber Adjust, Leather Wrapped Shift Knob, Leather Wrapped Steering Wheel, Power 6-Way Driver Seat, Security Alarm, WHEELS: 19 X 7 PAINTED ALUMINUM Tires: P225/55R19 BSW AS Touring, CONNECTIVITY GROUP Radio: 4.3S, Uconnect Voice Command w/Bluetooth, Leather Wrapped Steering Wheel, QUICK ORDER PACKAGE 28A Engine: 3.6L V6 24V VVT, Transmission: 6-Speed Automatic 62TE, Rear View Auto Dim Mirror w/Display, ParkView Rear Back-Up Camera, ENGINE: 3.6L V6 24V VVT (STD), TRANSMISSION: 6-SPEED AUTOMATIC 62TE (STD). Dodge SXT with Vice White exterior and Black interior features a V6 Cylinder Engine with 283 HP at 6350 RPM*. MORE ABOUT US If you are a new or veteran Chrysler, Dodge, Jeep or RAM enthusiast in the greater Rawlins, Evanston, Pinedale, Vernal area, you're in the right spot! Fremont Motor Rock Springs offers an envious selection of the season's hottest-selling Chrysler, Dodge, Jeep and RAM models as well as wide selection of reliable used cars. Horsepower calculations based on trim engine configuration. Fuel economy calculations based on original manufacturer data for trim engine configuration. Please confirm the accuracy of the included equipment by calling us prior to purchase. Welcome to Fremont Motor Company, the #1 Dodge Dealer in Wyoming & Nebraska! We take exceptional pride in our customer service, and we will do everything to make your Dodge car buying experience stress-free and fun. From the time you walk into our showroom, you’ll see why we are the #1 Dodge Retailer in Wyoming & Nebraska! Our Fremont Motor Rock Springs Dealership specialize in 2018 Dodge vehicles and we are excited to get you into a new one. For those that love raw power, the 2018 Dodge Charger and Challenger will not disappoint. Large families, no worries, the 2018 Durango and Grand Caravan have lots of room. Our other Fremont dealerships may also carry a variety of used, certified pre-owned and nearly new Dodge cars, mini vans, SUVs and trucks. 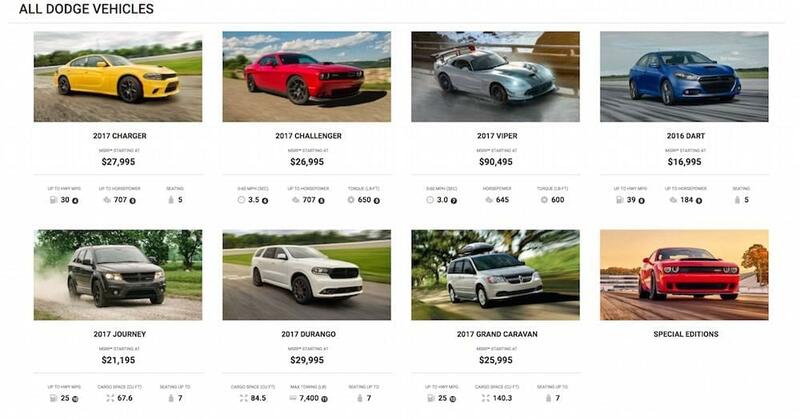 Click Here to see a full list of available Dodge vehicles.